Lake State celebrates a goal by Diego Cuglietta (centre) at the Great Lakes Invitational. Cuglietta signed an amateur tryout with the Texas Stars of the AHL. 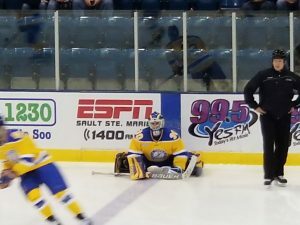 The most recent 100 point scorer for Lake Superior State has signed a professional contract. It was announced today that the Texas Stars of the American Hockey League (AHL) have signed senior Diego Cuglietta to an amateur tryout for the remainder of the 2018-19 season. A native of Kamloops, British Columbia, Cuglietta recently completed his senior season with the Lakers, where he had 25 goals and 16 assists for 41 points. 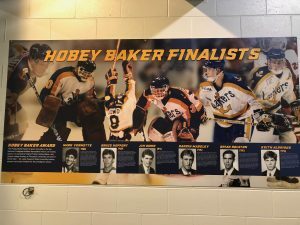 His 25 goals are the most for a Laker in a single season since Sean Tallaire had 32 in 1995-96 and his season point total is the best for any Laker since Joe Blaznek had 46 in 1996-97. In addition, his 100 career points are the most for a Laker since Dominic Monardo ended his collegiate career with 101 in 2012-13. Beyond the point totals on the ice, the team co-captain was named Most Valuable Player at the Great Lakes Invitational this season and is also a nominee for the Hobey Baker Award, given annually to the top player in college hockey. There have been six finalist from Lake Superior, but no winner as of yet. The Texas Stars, located near Austin, are the main minor affiliate of the NHL’s Dallas Stars. 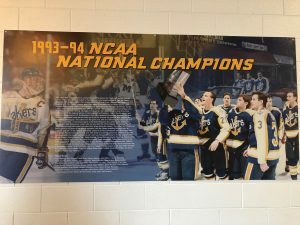 Should Cuglietta make it to the NHL with the Stars, he would become the seventh Laker to do so, following Keith Aldridge, Paul Jerrard, Chris Dahlquist, John Flesch, Dan Keczmer and Rob Valicevic. 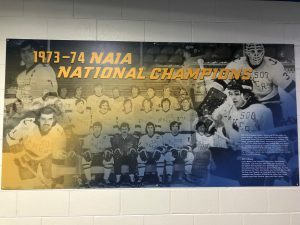 Jerrard, Dahlquist, Flesch and Keczmer played for the team while in Minnesota, while the rest were on the team while in its current home. All but one player has committed to a D1 school, and they’ve only lost 7 games. It’s been hectic here the last few weeks, so this will be about it for the week. I’ll try to put something out over the next week or so previewing the GLI, which I will actually be attending this year. I’ll probably also do some sort of mid-season update at some point during the break, explaining why some features have seemingly been left by the wayside. But stay strapped in Laker faithful. I have a feeling the wild ride that is this season is only starting. BLOOMINGTON, Minn. — The Western Collegiate Hockey Association (WCHA) today released the recipients of its Player of the Week accolades for the weekend of November 2nd and 3rd. This week, Lake Superior State freshman defenseman Jacob Nordqvist was honored as the Rookie of the Week. Nordqvist, who hails from Gothenburg, Sweden, had a goal and two assists during the weekend series against Michigan. His goal on Friday night was the game winner, while his two assists came in Saturday’s loss to the Wolverines. This is the first time Nordqvist has been honored by the league for his efforts and the second time a Laker has earned Rookie of the Week. Pete Veillette was so-named for his performance against Merrimack. Coincedentally, Nordqvist was an honorable mention that week for Defensman of the Week. 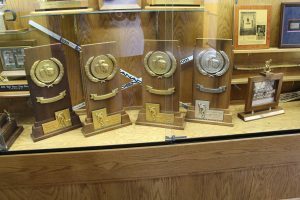 In earning the accolade, Nordqvist beat out Northern Michigan forward Garrett Klee, Minnesota State forward Julian Napravnik, forward Owen Sillinger of Bemidji State, Michigan Tech defenseman Colin Swoyer and Ferris State forward Hunter Wendt. Also receiving nominations from Lake Superior were senior forward Anthony Nellis and senior netminder Nick Kossoff. 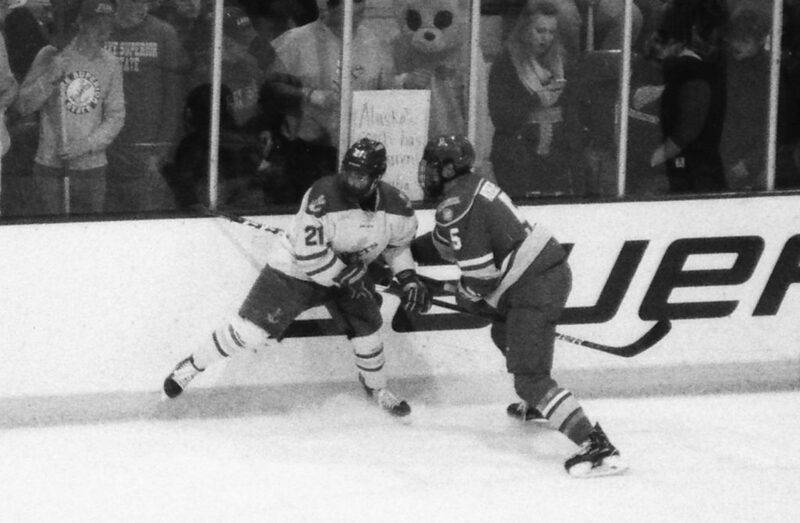 Nellis had a five point weekend (one goal and four assists), but was beat out by Minnesota State junior Charlie Gerard. Likewise, Kossoff (who stopped 28 of 30 shots on Friday night) lost out to Northern Michigan’s Atte Tolvanen. In addition, a goal scored by Max Humitz on Friday night was named by U.S. College Hockey Online.com as one of the Plays of the Week. Humitz’s goal made the score 4-1 Lake Superior en route to a 5-2 win by the home team. This is the second time this season that a play by Lake Superior has made the weekly list. Anthony Nellis’ penalty shot against Merrimack was the top play of that week. 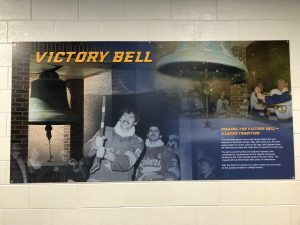 It appears that some new banners went up around Abel Arena during the offseason, featuring the 5 championship teams, Hobey Baker finalists and some history on the Victory Bell. To see them in person, you’ll have to venture on up to the arena. BLOOMINGTON, Minn. — The Western Collegiate Hockey Association (WCHA) announced its weekly award winners for the weekend of October 6th and 7th. Among the recipients of the honors this week were sophomore goaltender Mareks Mitens and freshman forward Pierre-Luc Veillette. Mitens, a native of Ventspilis, Latvia, started his first game of the season on Sunday, October 7th. In the game, he earned the second shutout of his collegiate career by stopping all 31 shots he faced as the Lakers won a tightly contested 1-0 victory over the Merrimack Warriors. 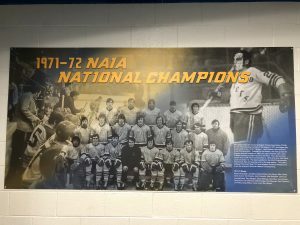 The sophomore edged out Bowling Green State junior goaltender Ryan Bednard to capture the honors. Although he was nominated for Rookie of the Week twice last season, this is the first time he has won a weekly conference award. Veillette, a freshman forward from Drummondville, Quebec, earned two assists this weekend, both coming in a 5-4 Saturday evening win. As this was the first week of play in his first season in college, it naturally follows that this is the first time he has either won or been nominated for weekly conference honors. In winning the award, Veillette beat out defenseman Tim Theocharidis of Bowling Green. Also receiving nominations for Lake Superior this weekend were junior forward Max Humitz and freshman defenseman Jacob Nordqvist. Humitz had two goals over the weekend, including the game winner on Sunday afternoon, while Nordqvist had two assists in the Saturday evening win. 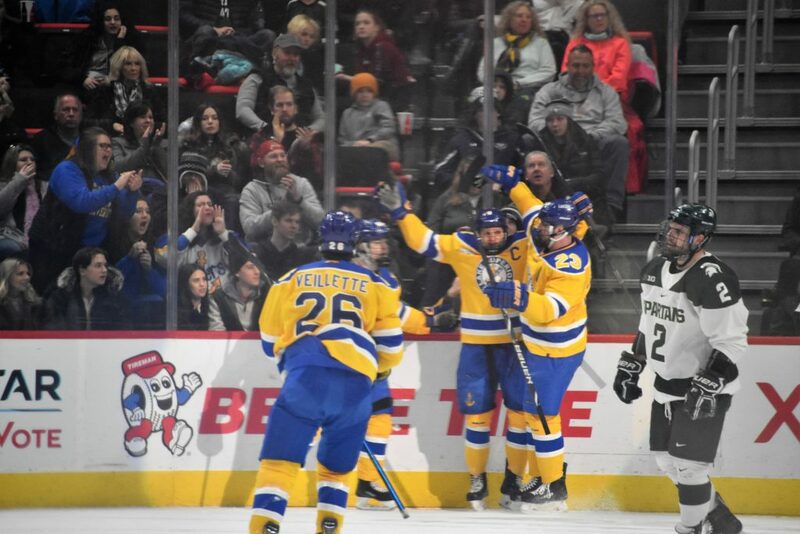 Coincedentally, Nordqvist’s two assists both came on goals by senior forward Diego Cuglietta and were the same goals that Veilletts had his two assists on. 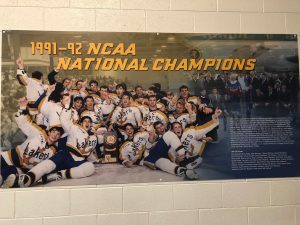 In addition to the awards garnered by Veillette and Mitens, Anthony Nellis’ game-winning penalty shot was selected as the top play of the week by U.S. College Hockey Online (USCHO). His play beat out Arizona State goaltender Joey Daccord earning an assist and a goal by Minnesota’s Rem Pitlick. BLOOMINGTON, Minn — The preseason polls were released today during the Western Collegiate Hockey Association (WCHA) Media Day. 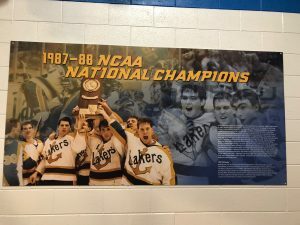 The Mankato Free Press Coaches’ Poll saw Lake Superior State picked to finish 7th, while the UAHHockey.com Media Poll had the Lakers pegged at 8th place. Minnesota State was selected to take home the MacNaughton Cup, awarded to the regular season champion, in both polls. 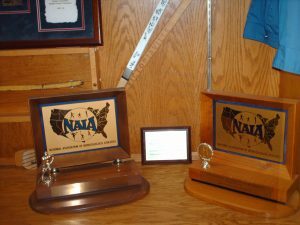 The Mavericks received 7 of a possible 9 first place votes in the Coaches’ Poll (coaches do not vote for their own team), while Northern Michigan earned two and Michigan Tech received one vote. The Media Poll saw 13 of 19 first place votes given to Minnesota State, while Bowling Green captured five and Northern Michigan picked up one. In addition to the polls, the preseason teams and WCHA Players of the Year were named. Northern Michigan had the Player of the Year from both polls — Adam Rockwood in the Coaches’ Poll and Troy Loggins in the Media Poll. No Lakers were named to either preseason All-WCHA team, though goaltender Nick Kossoff did receive votes for the media’s team. Minnesota State (13) – 182 pts. Bowling Green State (1) -159 pts. Northern Michigan (5) – 150 pts. Michigan Tech – 133 pts. Bemidji State – 110 pts. Ferris State – 102 pts. Alabama Huntsville – 69 pts. Lake Superior State – 57 pts. Alaska Anchorage – 28 pts. Minnesota State (7) – 88 pts. Northern Michigan (2) – 80 pts. Bowling Green – 76 pts. Michigan Tech (1) – 64 pts. Bemidji State – 54 pts. Ferris State – 49 pts. Lake Superior State – 40 pts. Alabama Huntsville – 35 pts. Alaska Anchorage – 18 pts. Both polls are based on a 10-9-8-7-6-5-4-3-2-1 scale. As mentioned, coaches did not vote for their own team in the Coaches’ Poll. The schedule for the Laker’s 2018-2019 campaign has been updated. 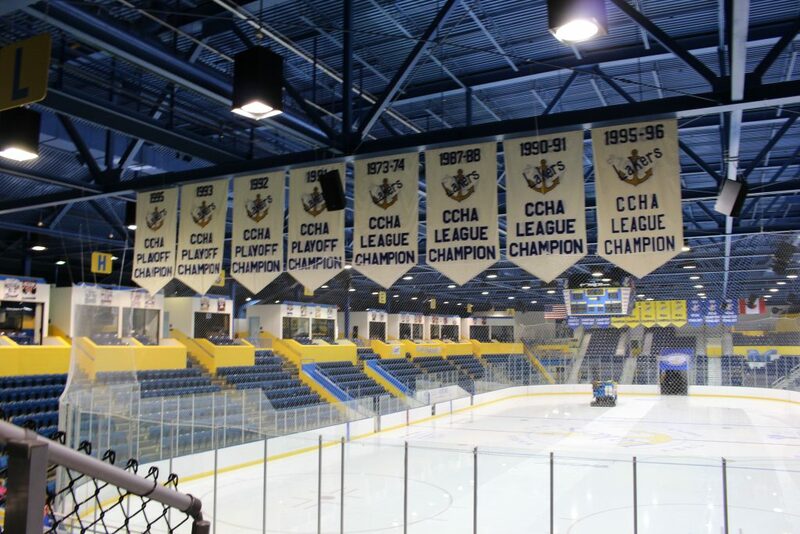 We here at Laker Hockey Blog would like to welcome all students back to the Sault for the 2018 school year. May both your exams and hangovers be short. But moreso, the new school year also signals a new hockey season! Yes, a new season is just around the corner, just over a month away as of the writing of this post. For those of us that run the site, however, that means a yearly update. Yearly update? That’s right, we are roundabout the one year mark here on LHB. I’m hoping to do a little post with some stats on this sometime this week, but before that, the aforementioned updates. …Yeah, that’s about it for right now. Good news though! The Roster has been updated, as of 8/27. If any changes are announced, we will be sure to update it. As for the schedule, I will be working on that throughout the week, as there isn’t exactly an easy or reliable way to cheese the system, so it will have to be manually typed out. Not hard, just time consuming. Another post will announce the update. Now, a note for the future: I was really hoping to get some quality content lined up for over the summer, and get some more of the pages filled out, and getting the site looking a bit more professional…and as you can see, I kind of failed at that. Hell, if it wasn’t for Mike, we wouldn’t have had any content at all, so kudos to him. But moving forward, I hope we can really start to realize my dream for this site, as a one-stop shop for all things Laker Hockey, but I suppose that bridge will be crossed when we get there, eh? But until then, please help us out by spreading the word. Like our Facebook page, share the page, share our posts. Like us and retweet us on Twitter. I hate begging, but in order to grow the site, it’s something that we’ll need. Thank you all for sticking with us for the last year, and hopefully you’ll be with us for many more. Go Blue!